The LCX-425T is a treadmill that provides a commercial-sized running surface in a space saving footprint. Perfect for the upscale home and residential condominium but durable enough for the hotel gym or corporate fitness facility. Engineered for convenience- At hand convenience with split-level consoles (designed to match the way you use a treadmill), two water bottle holders, magazine rack and tabs, and a utility tray. Programs and More- 9 programs with 10 levels which vary both incline and resistance offer a variety of workout options. In addition, there is Heart Rate Control (with user-selected target heart rate), Quick Start, and Manual mode. Custom Colors- Why stick with silver grey when there are five standard colors (white, black, platinum sparkle, metaltone gold, black chrome) to choose from? Or … select from over 180 custom colors to match any decor. Only CYBEX offers color customization in CV and strength equipment. Heart Rate Monitoring- Heart rate can be monitored from either the contact grips or hands free from a wireless heart rate transmitter. See it at a glance with a multi-colored LED that with a different color for specific target heart rate zones. Split Level Display- The console itself is designed to match the way a treadmill is used. By separating the console into two parts, we’ve given users the ability to use what they want and when. Time, speed, and incline are always visible on the lower level with other information on the top. Pulse Width Modulation (PWM) controller- Using digital feedback, the controller uses PWM technology for high-speed stability and consistent speed control with smooth operation. It also maximizes efficiency for economical power consumption. Programs: Quick Start, Manual, 9 Standard programs with 10 levels each controlling both incline and speed. *Note: Most of the sites, stores or shopping portals listed above sell Cybex LCX 425T Treadmill with discounts and other exciting offers. 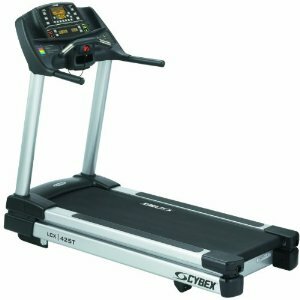 There is a possibility that the some of above websites are not selling Cybex LCX 425T Treadmill now. Toughtrain.com is not liable for such cases or instances. Also we do not recommend any seller for Cybex LCX 425T Treadmill and a buyer should buy from where he/she gets best deal with quality of products, service and on time delivery (shipment).